This young girl has a lot of support. Fortunately, they were consumed in the details of her study and did not notice me sketching away. I’m proud of this drawing both for its composition (in which one can see an interaction among the subjects), and its execution. The book on the chair and the backpack are visual elements that add to the impression that this moment in time is a study session. The gestures of the student and the man slouching in his chair add a bit of tension to the piece as well. 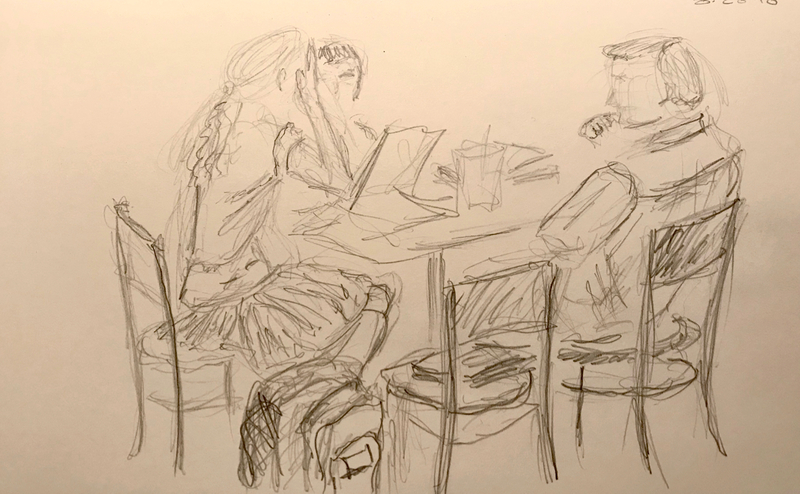 This entry was posted in Personal Stories and tagged artistic process, gesture, group dynamics, pencil sketch, portrait, sketch, study session, visual art, visual composition, visual elements. Bookmark the permalink. I agree. I think this image tells a whole story. I love the girl’s posture. Thank you, Claudia. Posture and gestures are essential.